Sure, you could wait. You could sit there, chilling inside the Mos Eisley cantina, biding your time while Greedo finishes his stupid speech. You could let him insult you, then just stare at him blankly as he tries to extort credits out of you. You could even let him make the first move. You could let him take the first shot. But why would you? All you need to do is pull that trigger to shut him up. It buys you a little time to gather up that cash for Jabba and it’s not like anyone in the cantina will even care. They’ll just about business as normal after you blast Greedo in his smug face. Shoot first. Always. Are you a shoot first, kind of girl? Then perhaps it’s time you stepped into the lucrative career of galactic smuggling, like Han Solo, the cheeky scoundrel from Star Wars. All you need is debonair attitude and the right outfit. This women’s Han Solo costume gives you an outfit that perfectly capture the look and attitude of the Star Wars character. It comes with a pull-on shirt that has an attached black vest. It also comes with pair of pants with printed designs along the side and a pair of attached boot tops that you can wear over your favorite boots. To top it all off, the costume comes with a belt and holster. Be sure to pick up a toy blaster to place in the holster, since you can’t shoot first unless you have a blaster of your own. This iconic costume makes for a great solo costume (sorry, pun intended), but it also makes for a great group, or couples Star Wars look! 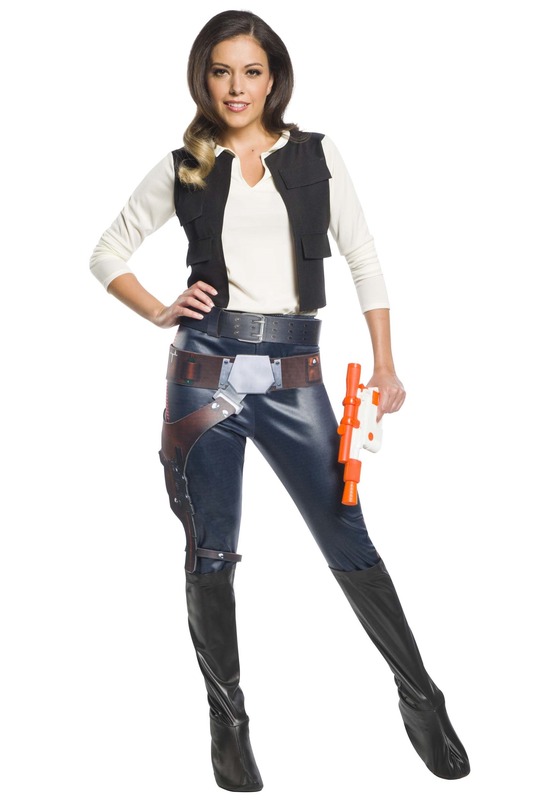 Just pair this outfit up with one of our many Chewbacca costumes to finish the look.